Whenever I think about the letter “A,” I immediately have the Dr. Suess “ABC” book running through my head. . .
Why, April begins with “A.” And that’s no April Fool! I wonder how many teachers are secretly rejoicing that this prankster’s holiday falls on the Monday after Easter and a lot of schools are still on Spring Break! My daughters were pretty disappointed. I can remember as a school-ager the hushed whispers and laughter in the halls, the girls’ bathroom and by the lockers as we discussed and planned how we would fool our teachers. We thought we were pretty tricky back then. Besides April Fool’s Day, as a child I remember that April brought with it a very real anxiety in the pit of my stomach. You see somewhere I read or heard or possibly even imagined that April was tornado month. I thought that most tornadoes occurred in April because of the changing seasons. The thought of those cool and warm masses mixing it up in the sky above my house caused me to lie awake many nights, especially if it was thundering or heaven forbidden a tornado watch in effect. The tornado scene in the “Wizard of Oz” terrified me. I lived in fear of being sucked up in a tornado in the middle of the night. I sweated each day of April and rejoiced at the first day of May, some how having avoiding another tornado season (little did I know back then that tornado season lasts all summer). I’m sure the fact that we had many tornado drills at school during April and that for some reason it seemed the “Wizard of Oz” always seemed to come on TV right around Easter contributed to my April/Tornado association more than anything else. These days I’m not as fearful April tornadoes (although I still have a keen ear for hearing the tornado sirens and will be the first one waiting on a bad storm in the basement – a must-have criteria when purchasing a home). In fact, April now brings with it anticipation of the longer days, spring flowers, budding trees, warmer weather and the A to Z. What about you? What do you think of in April? Leave me a comment below! April is one of my favorite months. I like the idea of a new beginning and transition. Plus I like the rain- but I dont live in a tornado area, so I’ve never known that fear! You are lucky you don’t live in a tornado area – I still have tornado dreams every once in a while. I like the new beginnings/transitions aspect of April too. April first always made me nervous when I was a kid, just waiting for someone to pull a prank. It was like walking on glass all day. Never was I so relieved than when that day was over. For some reason the prank idea never bothered me although no one really tried to prank me either! The ABC Book was one of my favorites too. April is Poetry Month, too. 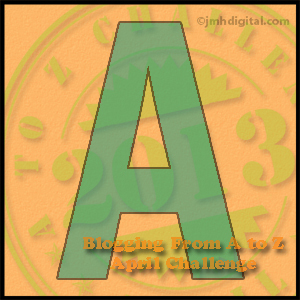 Best wishes for your A to Z blogging adventure. Thanks! I love poetry too. I used to write it a lot, but haven’t in a while. I need to get back to that. Previous Previous post: Does Perpetuating The Easter Bunny’s Existence Make Me A Liar?